"I cannot seek a divorce from my unemployed abusive husband as I can't afford alimony and 2 residences." "There should absolutely never be a thing called "permanent alimony". Half the time of any marriage no matter how long it was is more than enough time for the other spouse to become self supporting. In my very strong opinion should NEVER be over 5 years alimony. Every individual should be able to fend for themselves after 5 years maximum alimony. 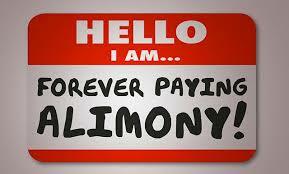 Permanent alimony is absurd and unjust. How can the other party ever move on with their lives?? Another spouse should not be able to take advantage of the system more than 5 years max and really it should be at 15-20 years and not 10. Think about it...California is the "only" state with such a ridiculous long term wrath and abomination of one party." Although I will point out that it is not true that California is the only state with such a ridiculously long term for alimony. Minnesota is every bit as bad. "If you get divorced why should anyone pay the other forever"
"If in a country where you can let go of your kids when they turn 18 years old and not be obligated to support them financially, why would you need to support an grown up adult person."